The one-story, brick constructed complex opened in 1972. 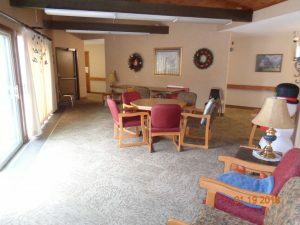 Situated on 2 acres, the three wings consist of 75 non-assisted apartments for elderly and disabled residents, with an on-site laundry facility, community room, and a family lounge in each wing. Floor plans range from approximately 550 to 575 sq. feet and include hot water heat, showers with built-in stools, carpeted living rooms and bedrooms, standard size refrigerators, and air conditioners. Parking is included. Residents pay 30% of their adjusted income, which includes all utilities, except telephone and cable. An excess fee is charged for a deep freeze and car plug-in. Pets are allowed with an additional deposit. Click the link below to view a video of an apartment.